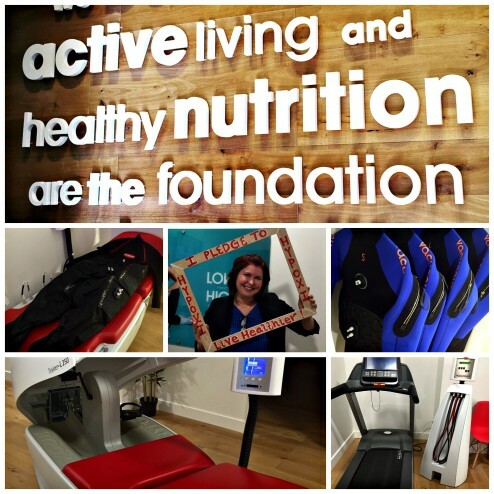 The first thing you’re probably asking yourself is… What in the world is Hypoxi!? Anyway, according to their website, Hypoxi is “a low impact exercise method that is 3 x more effective at burning stubborn fat than traditional exercise.” They utilize a vacuum + compression + a healthy eating plan to burn fat (and get rid of cellulite). It’s really space age. I found myself walking through the little studio wondering if I should be scared or excited. I think I was a little of both! The studio is small and you need to make an appointment, but the staff was very attentive. I wasn’t dressed that day to try anything out, but I did take some pictures and a copious amount of notes. After my tour, I decided that I would give Hypoxi a try. If anything… I though, this will be interesting! On my first day… I did a consultation with my trainer, a 3D body scan, measurements and weigh in. It was all very comfortable and not awkward at all. I was then led into the Dermology room. It’s relaxing with dim lights, a comfortable temperature and soft music. I slip into a snowsuit- like thing and lay down on the bed. My trainer connects me to some hoses that constrict and relax to stimulate circulation, diminish cellulite, and prepare my body for the next part of my session. I lay here and relax, enjoying my surroundings for 20 mins. Once released from the dermology suit… it was time to change into another suit- much like a wetsuit. I couldn’t squeeze into the Medium size vacunaut suit for my treadmill session. It was really comical trying to wiggle into it, but after a valiant effort… we opted to slip into the size Large. Once on the treadmill, I was connected to a few hoses that do the contract/release portion of the session. Then, I was just instructed to walk! That’s it. Walk and sweat in a neoprene suit. I walked for 30 minutes- burning 130 calories and travelling 1.5 miles. That was it! Painless! Although I was pretty sweaty! I skipped a day in between my sessions. I ate healthy. I drank plenty of water and followed the instructions I was given. Guess what?! When it was time to squeeze into the vacunaut suit for session two… I did it! It was a struggle, but I was able to shimmy myself in! I felt great about this! All I did was walk and sweat and get these amazing massaging hugs from a really cool machine! I was down a few pounds too. Bonus! In my next post- I’ll share with you exactly what I’m doing to follow along the Hypoxi instructions and my results from Session Three. You won’t believe it!